The Feds Annual General Meeting (AGM) took place on Mar. 21 at 5 p.m. in the SLC Great Hall. The meeting began with a packed room of students, Student Council members, and Feds executives who voted on many issues relevant to student life. First, the Feds fee was increased by 2.3 per cent ($0.86) to account for the Consumer Price Index (CPI), staff salary, and increased support for Feds advocacy. Feds elections for Councillors, Senators, and executives were ratified, as were the Legal Service Referendum and UPass Referendum. Katie Arnold, president of Engineering Society, spoke up against the ratification of Feds election results. During the voting period, some students, especially from Engineering and those on co-op semesters, were unable to use the online voting system. “I do believe that all the candidates that were elected will do well in their positions, I just personally do not ratify elections that I do not think were run properly,” Arnold said. The Legal Aid Referendum suggests the implementation of an opt-out Legal Protection Service for undergraduates at a cost of less than $30 per student. The UPass Referendum proposed that part-time students taking at least one course on campus be able to use their WatCard to access the Grand River Transit system. This was in addition to amendments made to articles 1, 3, 4, 5, 7, 8, 9, and 11 pertaining to the roles and scope of responsibilities of Feds executives, and to increase their accountability. Articles 5 and 7 also concerned electronic and proxy voting. AGMs are an opportunity for general members of an organization — in this case, all undergraduates that are a part of Feds — to meet with executive members of the organization and vote on relevant issues, as well as voice their own concerns. AGMs suffer from a chronic case of inattendance that often leads to quorum not being met. Case in point: Free food was provided at the AGM for attendees during a break in proceedings, after which quorum was no longer maintained. Another incentive for students to attend was the possibility of winning the raffle prize — a pair of Bose headphones. The problem of inattendance at AGMs is not exclusive to Feds, but it is one President Richard Wu is actively trying to address. Wu emphasized the importance of AGMs in the functioning of corporations such as Feds. 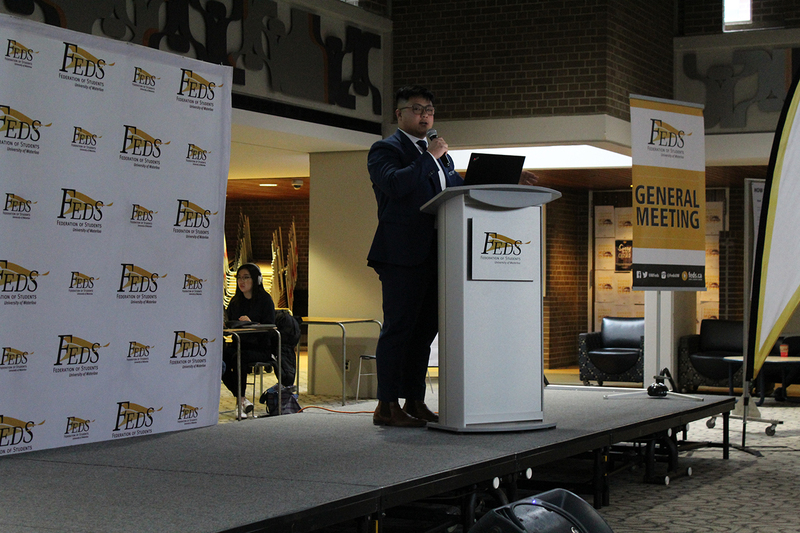 “General meetings are really important because, at those meetings, the Federation of Students as a corporation is allowed to ratify and approve by-law changes. That’s sort of the big function. But, at the same time, it’s also a place where undergrads can bring up issues for discussion and they can bring motions to the Federation of Students that basically guide us … [and] guide our direction,” he said. One of the most important parts of the AGMs was, according to Wu, amendments made to the by-laws that define Feds’ code of conduct and set ground rules for how they can act as a corporation. Wu has also offered to clarify any questions that students may have about anything to do with Feds, their by-laws, policies and procedures, function, or any other aspect. For more information, visit feds.ca or email Richard Wu at pres@feds.ca.